Mission Statement Pacific Historic Parks supports the National Park Service through research, preservation, restoration, fund development, education and interpretive programs of WWII in the Pacific and other Pacific historic sites. 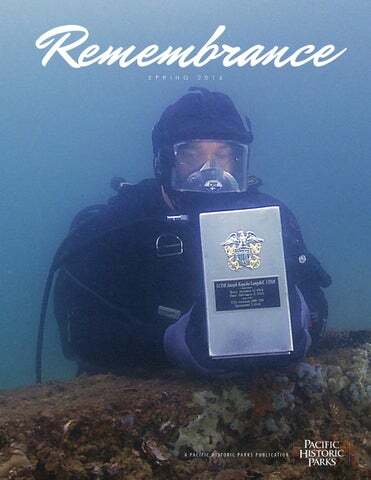 Remembrance is published four times a year as a benefit to members of Pacific Historic Parks. President’s Message p. 3 Our Survivor Updates p. 19 Point of View p. 25 Cover: USS Arizona Ensign Joseph Langdell is interred into the hull of the Arizona on Dec. 7, 2015. Photo by Brett Seymour, NPS Submerged Resources Center. President’s Message Aloha, I would like to welcome you to the spring issue of Remembrance. Since joining Pacific Historic Parks (PHP) as president and CEO six months ago, I have been working to ensure that three words continue to remain at the core of our foundation: Remember, Honor, Understand. Your support has enabled PHP to complete preservation projects, such as the restoration of the USS Arizona Memorial Shrine Room, provide award-winning educational programs in Hawaii, Guam, and Saipan, and to be a major supporter of the Dec. 7th commemoration activities. A new program currently in development is an audio tour program for Diamond Head State Monument that will focus on sharing its history and providing a greater understanding of the iconic landmark. I invite you to learn more about these programs that are made possible only with your support in this issue. An overview of the impact of your support can be viewed in our annual report on page 32. Ray L’Heureux with Herb Weatherwax This year marks the 75th anniversary of the attack on Pearl Harbor, and I am honored to represent PHP as part of the Governor’s blue-ribbon committee formed for this milestone anniversary. Retired Adm. Thomas B. Fargo has been appointed by Gov. David Ige as the chairman. The chair of the 75th events committee is PHP’s board chairman, Neil Sheehan. As commemoration activities and events are confirmed, you will find updated information online at www. pearlharbor75thanniversary.com. To learn more about the 75th Commemoration, turn to page 30. As PHP grows towards serving future generations, it has been exciting as we approach the launch of our newest program. A new digital portal is being created in partnership with the National Park Service (NPS) and HDR, Inc. and will be launched during the 75th Commemoration week. This new digital platform will include interactive educational exhibits for visitors to the park, as well as online interactive exhibits for those unable to visit. In order to serve you better, we have been undergoing a revamping of our membership computer system that will provide for a more communicative and secured service for our PHP members. We are in the final stages of the process, and I thank you for your continued patience. We also listened to your feedback, and Remembrance is returning to a larger quarterly format in order to better serve our members, especially the more than 1,600 Pearl Harbor Survivors Association (PHSA) members that joined our family when PHSA and PHP merged five years ago. Remembrance has become an important vehicle through which Pearl Harbor Survivors across the nation and their families stay in touch, and it is only through the support of all PHP members like yourself that we are able to continue to honor and preserve their legacy. Finally, I would like to welcome World War II Valor in the Pacific’s newest superintendent, Jacqueline Ashwell. Please read more about Jacqueline, her commitment to NPS, and the wealth of experience that she brings with her to Valor on page 10. Thank you for your continued support. Ensign Joseph Langdell was interred into the Arizona on Dec. 7, 2015.
understanding would do away with war.”3 Perhaps the first recorded example of that individual gesture of reconciliation occurred in 1950 when Jacob DeShazer, a Doolittle Raider and prisoner of war, met Mitsuo Fuchida, a Japanese Navy aviator and leader of the attack on Pearl Harbor. These former warriors found fellowship in Christianity. Fuchida had read DeShazer’s book, I Was a Prisoner of Japan. He was moved by DeShazer’s personal history and his reintroduction to Christianity while he was a prisoner of war in solitary confinement. Fuchida was so inspired by that book, he too sought out his own salvation by becoming a minister himself. Above, left: Pearl Harbor Survivors stand and salute during the 74th commemoration ceremony. Photo by Donny Chambers. Above, right: Hawaii Gov. David Ige greets attendees at the 74th commemoration ceremony on Dec. 7, 2015. Photo by Brett Seymour. They would meet in 1950 in Japan and became close friends. That friendship motivated Fuchida to write his book, From Pearl Harbor to Golgotha, in 1953. That friendship led to Fuchida’s coming to America to preach. “Live Dive” broadcasts allow viewers a glimpse of the submerged USS Arizona. The USS Arizona is one of the most prominent parts of World War II history, yet very few have ever been able to see what the vessel looks like. Visitors have had to use their imaginations of what lies beneath the waters for nearly 74 years. Even the interpretive staﬀ at World War II Valor in the Paciﬁc National Monument (VALR) has had to rely on techniques other than ﬁrsthand visual or tactile experience as none of them SCUBA dive and thus would be unable to see or touch the ship. However since 2010, VALR has worked to illuminate what happened to the USS Arizona using high deﬁnition video and augmented reality. Beginning in 2014, VALR has been able to broadcast a live video stream from beside the ship. This is no trivial task as the ship and Pearl Harbor present a whole host of technical challenges. In October 2015, nearly 6,000 viewers from around the world watched a “Live Dive” broadcast and interactively asked questions for more than an hour. They were able to develop a connection to the 1,177 men who died aboard the Arizona. This project involved extensive and interdependent collaboration. The core team consisted of public, nonproﬁt and private partners from the National Park Service (NPS)’s Submerged Resources Center (SRC), Paciﬁc Historic Parks (PHP), Woods Hole Oceanographic Institution’s Advanced Imaging & Visualization Laboratory, and Ocean Technology Systems. The NPS staﬀ was interdisciplinary, with members from interpretation, cultural resources, and education leading the project with vital support rendered from information technology and maintenance. This team was able to communicate more than 20 years of research conducted on the vessel and actually show the physical environment of the studies. They were also able to demonstrate the importance of ship engineering, coral recruitment, ﬁsh reproductive behavior, organic chemistry, species diversity, and other STEM topics directly associated with the USS Arizona. These topics were supplementary to the approach of giving visitors a visual understanding of what happened to the ship in 1941. The team continues to meet in order to improve their approach for future broadcasts. Recordings of the “Live Dive” are available online for viewing at www.youtube.com/watch?v=bzhycBvBiYE. Please check the NPS and PHP websites for information on future broadcasts. Rev. Ryujo Fujita, Japan Religious Committee for World Federation, delivered a Prayer for Peace. Photo by Brett Seymour. On Oct. 19 of last year, Jacqueline Ashwell assumed her new role as superintendent of World War II Valor in the Pacific National Monument. Immediately prior, she was superintendent of the Seattle area National Park sites, including Klondike Gold Rush National Historical Park – Seattle Unit, the Bainbridge Island Japanese American Exclusion Memorial, Wing Luke Museum Affiliated Area, Outdoor Recreation Information Center at REI’s flagship store, and the Seattle Trails and Rails program. The overall goal is to give the visitor a deeper understanding and profound appreciation for Diamond Head in all of its multiple contexts – visual, cultural, and scientiﬁc. Olivia: My Life of Exile in Kalaupapa, originally published in 1988, chronicles Olivia Breitha’s personal and medical history from the age of 18, when she was first diagnosed with Hansen’s Disease, (also known as leprosy) and exiled to the settlement of Kalaupapa, on the island of Molokai. Olivia’s book tells us more about her half-century of life as Hawaii Department of Health parolee No. 3306 than she felt she could ever reveal. “It was never my intention to share so many intimate and disturbing aspects of my life with total strangers. Many times I wanted to quit the whole business and keep all my pain inside, where it belonged, hidden from the world. Why bother? People have their own problems. Who cares what I’ve been through anyway? It took many years and the patient help of family and friends to convince me that it was only by opening up that I could come to some kind of peace with myself, with our fearful society, and with the generations of government and healthcare authorities that helped to institutionalize that fear. I think that expressing myself through this book has helped make me a more caring and understanding person.” She added, “I finally regained the sense of dignity that was taken from me when I was a child. It’s taken a long time for me to feel this way again. I’m glad I stuck it out,.” Olivia was not one to succumb to life’s difficulties. She met every challenge head on. Through her own words, you will discover a woman of immense strength, whose transformation from a social outcast to a powerful eloquent social activist has inspired tens of thousands of readers around the world. At the age of 90, around 10 years ago, Olivia left this world, but her thoughts and words are just as strong and continue to inspire us today. After almost 30 years in print, it was time for her book to go through a makeover. Olivia’s own words will remain unchanged. However, more pictures are being added in a new edition to provide more insight into the life of Olivia. A new edition of “Olivia” is being published by PHP. Damage to American Memorial Park was widespread. NPS Ranger Art engages with teachers at the entrance to a WWII bunker built by the Japanese. At Asan Beach, teachers identify seashore creatures and rare indigenous plants. much fun, so my Thanksgiving weekend was spent at the park showing them what I learned.” The workshop, funded by PHP, is free of charge and offered twice a year during the fall and spring semesters. Teachers are eligible to earn one graduate credit from the University of Guam. Teachers of all grade levels and subject matters are welcome to sign up. PHP provides free bus transportation to the sites. High school students are trained in scientific methods for gathering data. to participate in this. Our park is now able to provide high quality, curriculum-based service-learning activities to the underserved community of Guam. WAPA is a perfect setting for a program like this, with over half of our public park lands underwater and inhabited by coral reefs containing the highest levels of species diversification within the National Park Service (NPS). Students record data to be shared with NPS and globally through the Coral Watch program. Technician Allison Miller and I also provided training on park safety protocols in addition to scientific monitoring methods for gathering data. The “Serve” portion got the students in the water for snorkeling events to gauge the health of the corals within our park. They made observations on the health of different species of corals, recorded it, and then transmitted it to natural resource managers within NPS and globally through the Coral Watch program. The “Inspire” portion of the program, which has yet to be implented, will provide training on public speaking and how to create effective public service announcements and presentations. This instruction will allow the students to develop the skills needed to convey their experiences to help educate their peers and the general public about environmental issues in our community. The positive response and the potential for sustainability has led NPS administrators to express their intention of not only continuing this program, but expanding on it in the near future. To date we have already added one more permanent site that we can monitor, and plans are being made to add two more in the next year. Partnerships with other federal and local agencies are also being cultivated so that more resources will be available to us to enhance this program. We are very excited to see this program grow and then see the future achievements of the Preservation Rangers. It is my hope that this program will inspire the students to be environmental stewards and help to preserve and protect our island’s rich natural resources. Society, Japanese Cultural Center of Hawaii, Golden Gate National Parks, and Hawaii Department of Education. These speakers, along with the VALR ParkED team, introduced new curriculum, inquiry-based pedagogy, and a unique historic lens that can be readily incorporated into the classroom and become a part of a nationwide curriculum. ParkED by the Numbers At ParkED, we inspire, educate, and connect students with the stories of Pearl Harbor. Above, left: Lau Sualevai, NPS education specialist, visits Aina Haina Elementary School. Photo by Lori Kuwahara. Above, right: Uncle Jimmy Lee, a witness to the Pearl Harbor attacks shares his story with eighth graders from Ka Waihona o Ka Naauao, a public charter school in Nanakuli. Photo by Johanna Yeomans. Below: Sualevai, NPS education specialist, speaks to Mililani Middle School student at Valor. Photo by Johanna Yeomans. 42.8% High School *Such as continuing ed. Herb Weatherwax and Uncle Al Rodrigues while attending a regional conference in March 2016. 2 Uncle Al Rodrigues celebrated his 96th birthday on Feb. 7, 2016. 3 Uncle Sterling Cale, a former Eagle Scout, visited Cub Scout Pack No. 388 from Pearl Harbor at the USS Missouri during their Blue and Gold Ceremony in July 2014. Photo courtesy of Sterling Cale. 17, 2016. From left: Tanya Bumanglag, Uncle Everett, Edean Saito, and Val Gonda. 5 Woodcreek High School students from Roseville, Calif., serenade Uncles Al and Sterling in March 2016. Punahou School students in Hawaii volunteer one Saturday each month to help spread Sadako’s message. and professors from Japan accompanied a group from Punahou, observing the high school students interacting with our visitors. Afterwards, they wished to expand the Sadako Peace Crane Project to schools in Japan. The Sadako Peace Crane Project has students in Japan write a message of peace on a piece of paper that they will eventually fold into a paper crane. They all have wonderful words promoting world peace and reconciliation: •	“Past is the past. Let’s think about our future! Pray for peace.” •	“I think it’s difficult to understand each other. But, we must try to understand each other. Let’s work hard and do our best!” We’ve since received almost 2,000 of these very special cranes and in turn share them with our visitors at Pearl Harbor. One teacher from Tokyo wrote, “Today, students in Japan are learning about what happened in World War II in their social studies class but didn’t know what people in the U.S. have thought about it. We are very happy this project will promote reconciliation of two countries and spread peace around the world.” Otowa Junior High School students in Japan write calligraphy peace messages. 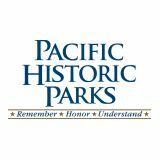 Pacific Historic Parks (PHP) appreciates when members choose to include an extra gift when sending in their membership renewal payment. At times it might be an additional donation, a contribution dedicated to a loved one’s memory, or sometimes clippings from a special event. Karen Richardson from San Clemente, Calif., recently shared with us her mementos from a very special event that took place last year on what would have been her father’s 94th birthday. Karen’s father, Ardenne Allen (A.A.) “Bill” Woodward, died aboard the USS Arizona during the attack of Pearl Harbor on Dec. 7, 1941. However, the 70-year-old War Memorial in Huntington Beach, Calif., did not include a recognition of Woodward. City Historian Jerry Persons noticed the omission of Woodward’s name after stumbling across a copy of Life magazine dated July 5, 1943 that listed the names of Americans who had died during the Pearl Harbor attack. He searched for Woodward’s wife and daughter, and with the help of City Councilman Dave Sullivan, himself a Vietnam War Army veteran, tracked down Karen. The City of Huntington Beach and American Legion Post 133 held a special ceremony on June 9, 2015, for the unveiling of the new memorial with the inclusion of A.A. Woodward’s name. The ceremony was attended by Karen, her daughter, and grandchildren. PHP would like thank PHP member Karen Richardson for sharing her family history with us, the City of Huntington Beach, American Legion Post 133, and all those who share PHP’s mission in realizing the importance of Karen’s words: “...it is never too late nor has too much time past to *Remember*Honor*Understand*.” Unfortunately, like many others, Karen never had a chance to meet her father, but ceremonies and special tributes like these keep multiple generations connected to history and family legacies. Karen has also contributed letters exchanged between her parents to the book Battleship Arizona by Paul Stillwell. The Huntington Beach Ceremony is available for viewing on YouTube. The Magic of a BY EDEAN SAITO, SPECIAL PROJECTS MANAGER The Pro Bowl on Jan. 31, 2016, was the main draw for 15 Wish kids to visit Hawaii. Accompanied by their families, a group of 73 made a visit to the USS Arizona Memorial. Pearl Harbor from all across the United States. It was 15-year-old Max’s dream to come to Hawaii from Florida. In August, we helped to fulfill his dream with a visit to Pearl Harbor through the Dreams Come True program. It’s truly amazing how much magic is in that all powerful wish and what an honor it is to help make that wish a reality. The Make-A-Wish Foundation, a nonprofit organization founded in 1980, grants the wishes of children with life-threatening illnesses. Do you have a special photo taken at one of our parks that you would like to share? Pacific Historic Parks will select a few images captured by our members for printing in each issue of Remembrance. E-mail your submission to membership@pacifichistoricparks.org. grew. Included are many photos and examples of the various local chapter, state, and national programs that embodied the association’s motto: “Remember Pearl Harbor – Keep America Alert.” To access the Gram online, visit Pacific Historic Parks’ website at grams.pacifichistoricparks.org. The Gram archives have been organized by decade, which can be further explored by year. Find the issue you are interested in and read away. The Gram evolved over the years as the times changed. From left: the first issue, published in 1964; the 100th issue, published in 1989; and the last issue, published in 2012.
this December to play an active role in the commemoration of this world-changing event,” says Tony Vericella, executive director for the 75th Commemoration Committee. “Special events will rekindle memories, bestow tribute, stimulate hope, and bridge generations. Travel companies – airlines, accommodations, tour wholesalers, and online travel agencies – are creating special package offerings to make it easier for you.” For those who cannot travel to Oahu, you can still provide your support in many ways – join in the remembrance by watching the live stream online on Dec.7; make an online donation to the 75th Commemoration Fund; purchase 75th anniversary merchandise online, for your family, for veterans, and active service military you know; or simply help to raise awareness by spreading the word to your family, friends, colleagues, and community. Additionally, to commemorate the 75th anniversary, Pacific Historic Parks will be releasing virtual reality experiences via a Google Cardboard app, allowing those both young and old to experience the USS Arizona Memorial and Pearl Harbor in new ways. This app will enhance the visitor experience while engaging millennials through cutting-edge technology. More details about this exciting project will be coming soon. tour experience that is found at the Visitor Center,” said PHP Director of Retail Services John Hirabayashi, “ATB garments are made entirely in the USA, using high quality fabrics and printed with water-based inks for a softer feel. The artwork is patriotic, modern and minimalist, and all pieces were created inhouse by ATB’s design team.” We invite you to see the complete ATB Pearl Harbor Collection by visiting the PHP retail store at the Pearl Harbor Visitor Center or online at www.phpstore.org. All proceeds from the retail sales support education, interpretaion, and operations of PHP’s park sites. From left: Adam Worrel, Josh Miller, and Troy Malesky are the founders of American Tribute Brand. Photo courtesy of American Tribute Brand. Your support makes it possible for Pacific Historic Parks (PHP) to provide important funding for programs such as restoration, preservation, and education as we continue to fulfill PHPâ&#x20AC;&#x2122;s mission. Membership Be a part of the PHP membership by joining online, at any of our sites, and through our online and retail stores. Donations Your one-time or recurring donation can be easily set up online or by checking the box on the membership/donation form found in the center of this publication. To Donate or Join, Please Contact Us: Online: www.pacifichistoricparks.org By mail: Pacific Historic Parks P.O. Box 29940 Honolulu, HI 96820-2340 808-954-8726 For additional ways to give, such as setting up an online giving page in honor of a loved one, in lieu of flowers, or to make a contribution through an IRA charitable rollover, contact Director of Development Luella Costales at 808-954-8723 or lcostales@pacifichistoricparks.org. 3 1 Colette Higgins, a history professor at Kapiolani Community College, serves on our board of directors. 3 Survivor Uncle Al Rodrigues toured the FBI Hawaii office after giving a presentation. 4 Joe Shea volunteers at the Pearl Harbor Visitor Center donation desk. Connecting Generations Mililani High School JROTC visits Survivor Uncle Herb Weatherwax during a tour of the USS Arizona Memorial.